This lesson describes how to add, edit, and/or remove IEP Invited Participants. This lesson requires that you have selected a student and are viewing a single student's record. If you are unsure how to locate a student, see the "Find a Student" lesson in the "Students" manual for help. This lesson also requires that you have added an invitation. For more information on how to add an invitation, see the "Create an Invitation" lesson in this manual. From the IEP Wizard Quick Resume Menu, select IEP Wizard Invitation Participants. 1. Indicate Parent/Guardian by typing part or all of the name in the text box and clicking on the name to select it. Note: Only Parents flagged as Legal Guardians in Student Contacts can be added. 2. Indicate the District Representative by typing part or all of the name in the text box and clicking on the desired name. In the "Title" text box, type the desired title (e.g., Principal, Designated Case Manager, etc.). 3. Indicate the MET Representative by typing part or all of the name in the text box and clicking on the desired name. In the "Title" text box, type the desired title (e.g., Principal, Designated Case Manager, etc.). 4. Indicate the General Education Teacher by typing part or all of the name in the text box and clicking on the desired name. In the "Title" text box, type the desired title (e.g., Teacher, Teacher Leader, etc.). 5. 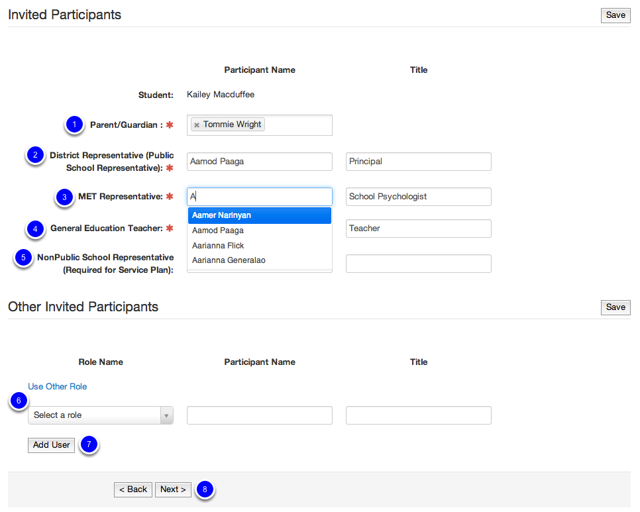 IF writing a Non-Public Service Plan, indicate the Non-Public School Representative by typing part or all of the name in the text box and clicking on the desired name. In the "Title" text box, type the desired title (e.g., Principal, Designated Case Manager, etc.). Note: Leave this field blank if you are not writing a non-public service plan. 6. IF you would like to add another participant that already exists in Illuminate, click the Drop-down, select the role and type all or part of the new participant's name in the text box followed by clicking on the desired name. IF you would like to add another participant that DOES NOT already exist in Illuminate, click the "Use Other Role" link and then type the user's Role Name, Particpant Name, and Title into the text boxes (e.g., Physician, Dr. Reddy, Family Physician. 7. Click "Add User" to add additional participants as necessary. 8. Click the "Next" button to save everything and advance to the next screen. Click the "Back" button to save everything and move to the previous screen. Additional participants can be removed by clicking the Red X Icon next to his/her name. Once you have successfully added all Invited Participants to the IEP, you are ready to print the IEP Invitation. Click the Next button to proceed to the IEP Wizard Invitation Print page. For more information on how to print an IEP Invitation, see the "Print an IEP Invitation" lesson in this manual.